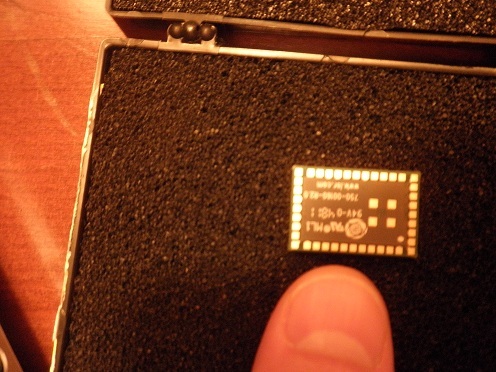 Project Help and Ideas » What kind of IC package is the TI CC3000? I bought a CC3000 WiFi Chip that I want to connect to my Atmega128 via SPI. What kind of chip package is this? I need to figure out what kind of adapters/sockets are available so I can determine how to connect it to the Atmega128. That would have to be mounted to a board via reflow. I don't think there is any way to "hand solder" that package with an iron. That package style is a no lead style (could be QFN or TQFN or some similar or could be a module of some sort). Either way you would definitely need a good quality board to mount it to and would need to reflow solder it down. That would have probably been one to have purchased mounted to a board with the antenna circuit design work done. Wow, that is a great "module"!! As a module it is not a standard package so you will not find normal breakout boards available! You will need to make your own or get something like this. Mouser has a evaluation board but I think that comes with a module which you already have, but that really makes it interesting for $53.46. This module offloads most of the mcu responsibilities, it has a internal TCPIP stack, which is one of the biggest challenges for mcu programming! You probable will get better answers on a dedicated wifi forum or even on a Arduino forum. Otherwise, you would have to import/make the package into Eagle or some sort of PCB CAD program and either make your own board or have one made, but then you would still have to do some soldering. Sparkfun has some tutorials as well as other people on Youtube have tutorials of soldering difficult chips like that. Don't be discouraged by it's look though. Good luck, keep us posted. Avoid long routes on top layer beneath module. Via fanout beneath module is acceptable. And on another page it states "Only a single reflow soldering process is encouraged for host boards." This part is clearly not a hobbiest part in this form. Maybe jlaskowski has access to good design software and can have a 4 layer prototype board made up? I'd love to see him make something of it. If he doesn't, I'll stick to my original comment where I stated it would have been a good one to purchase mounted. Thanks, folks. I went ahead and ordered the evaluation board as a first step. When I actually get the MCU talking to it via SPI and have a working wireless TCP/IP connection to a Java program on my laptop, I'll take on the challenge of PCB design/fabrication. It seems there's a lot to learn and I found a nice PCB design tutorial online. When it comes to reflow soldering, some videos show people making MCU-controled toaster ovens to regulate temperature delta per component specs. Other people sort of "wing it" with a heat gun. It seems a newbie like me would probably destroy some chips trying to use a heat gun and might be better off with an MCU temp-controlled toaster over. Any thoughts? Does anyone recommend a solder paste product for reflow soldering? Some even use a frying pan. I have a "MCU temp-controlled toaster oven" on my todo list. Of course first I have to learn how to make/draw a PCB. The PCB design tutorial is "about" PCB's not a tutorial on actually making one! Eagle is used by a lot of people. Sometimes if you want a certain supplier to make your PCB's you have to use their designated PCB layout tools. Guess that just shows my ignorance. I obviously don't know anything about this chip or more complicated chips. I have just seen that style before and thought it may be of use to someone. I have not tried it out. Thanks for correcting me and steering him in the right direction. David, I apologize if I came of like an A$$. I do that sometimes without intending to. As for Eagle, Ralph, the free version only allows for two layer boards. The design spec in the datasheet states a 4 layer design. So inexpensive design options might be difficult to come by. jlaskowski, keep us up to date on your progress, this seems to be an interesting project. I'll definitely keep you informed. This is going to be a lot of learning, but I seem to be getting through it step at a time, thanks to everyone's help on the Nerdkit forums. Right now, I'm studying SPI and how it's implemented on the Atmega168 (which I mistakenly called the Atmega128 above). It's coming together for me. When the CC3000 WiFi EM board shows up, I'll wire it to the MCU's SPI. The SPI connections will be between 2 devices with different voltages (MCU is 5V and CC300 is 3.3V). I got some help on another post as to how to use a 3.3V regulator and the MOSFETs that came with the Nerdkit. After that, it'll be writing to the SPI to configure the C3000 to connect to my router, including security settings. Then it'll be a matter of implementing it's TCP/IP functions and send a message to a TCI/IP server I'll write in Java on my laptop. Perhaps I'll just send the temperature from the temp sensor project. I supposed when that's done, I'll look at designing a board to transfer all this off of the EM Board and solderless breadboard that came with the Nerdkit. For anyone else with QFPN (Quad Flat Pack No-leads), type SMT packages, I found this outfit that has adapters. I have not tried it myself, not ready to do SMT stuff (working up the nerve to try it :D), so if anyone does, please post back on their impression. They certainly have nice selections for breakout boards, thanks Boba.